I have been cooking for a very long time; thus it is not often that I surprise myself with what I make. But I have to say, I called Kate into the kitchen, cut the first falafel in half, so we could each taste it, and when I popped it in my mouth, I was genuinely delighted! It actually tasted like a real falafel; I could not believe it. 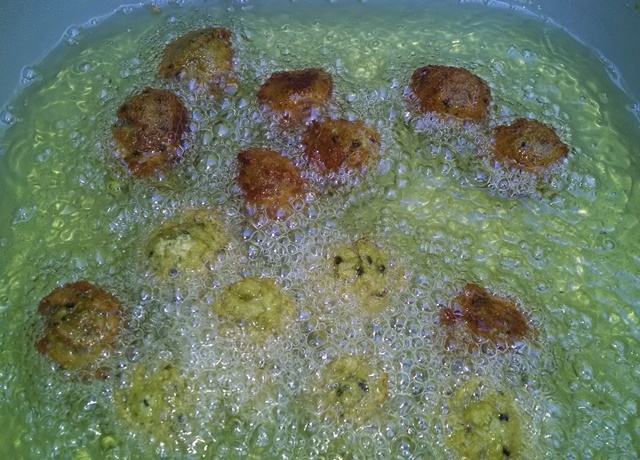 I love falafels; I often make them at home, but always from a packaged dry mix, that requires only that one add water. I decided to try my hand at making them from scratch. 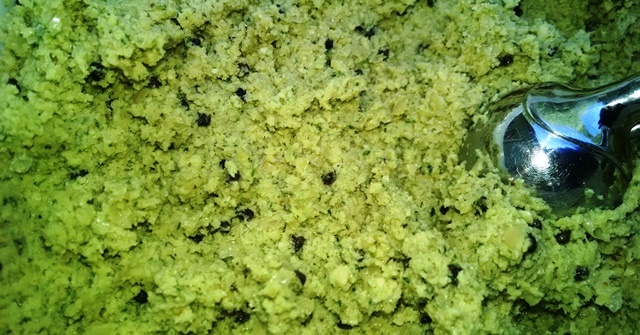 I have to say, I cannot imagine how people make falafels without a food processor – the dry garbanzos are soaked, but not cooked, when you grind them with the herbs, spices, and onion. I went through my cookbooks, looking for and comparing recipes; I then went to the internet and continued searching for a recipe that I could make. When I started to assemble the stated ingredients, common in most recipes, I realized that I was out of one of the most commonly used spices in my kitchen, ground cardamom; fortunately, I had a handsome collection of the much prized whole seeds. Sitting on my counter, previously untouched, as I thought of it as a work of art, was a beautiful Cuban mortar and pestle that had been given to me by Patri; I decided crushing the cardamom was a worthy maiden task for the gift – it worked perfectly! I do not like to fry food inside my house, but the first time I made these falafels, the weather did not cooperate, so I cooked them indoors. However, an electric skillet, works just as well outside as it does inside. Do not be afraid to try this, it is a very forgiving recipe. I served them as if they very large croutons on a bed of salad, using my own tzatziki as the salad dressing. The night before you are going to cook the falafels, wash a bag of chickpeas, and put them to soak, add three garlic cloves to the water. 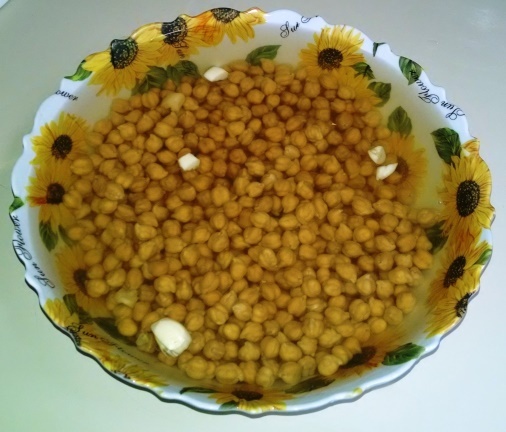 The next day, with a slotted spoon, put half of the soaked chickpeas in the food processor, add the rest of the ingredients, then the rest of the chickpeas, and process until it is consistency of cookie dough. 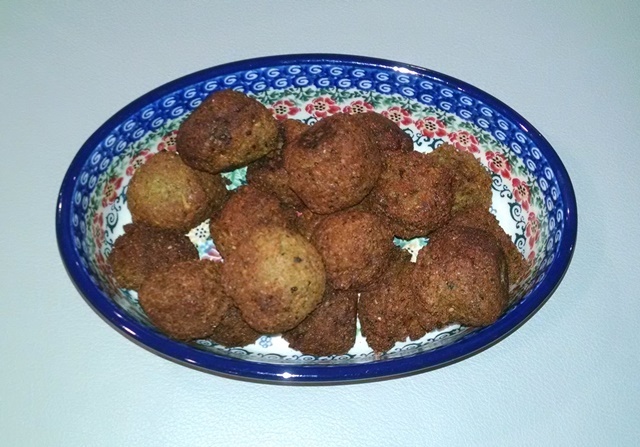 Using a small scoop or your hands, if you do not have a falafel maker, as I did not, form small balls, to be fried in vegetable oil, at about 400 degree, until they are golden brown. The left over mix can be stored in the refrigerator until you are ready to make more falafels! I have also added, in addition to the Mint, dried Dill, about a tablespoon, and fresh Parsley, in equal portions to the Mint. I love this sauce and also serve it with any grilled meat. Peel or not, you choice, the cucumber and the shred it into the yogurt and the rest of the ingredients, stir well and chill at least several hours, but overnight is best. This entry was posted on July 24, 2018 at 3:09 pm and is filed under Food, SlideShow. You can follow any responses to this entry through the RSS 2.0 feed.